What is it? How is it calculated? Who has to pay it? Who pays child support and how much they pay is outlined in the Arizona Child Support Guidelines. Several variables have to be evaluated before an award of child support is calculated. Child support can be easily calculated under the Arizona Child Support Guidelines after several other variables have been determined. The two main factors are Gross monthly Income and Combined Adjusted Gross Monthly Income. The main factor when calculating child support is each parent’s monthly gross income. Gross income includes: receipt of spousal maintenance, social security, workman’s compensation, severance pay, commissions, disability benefits, unemployment benefits, retirement plans, interest, self-employment, bonuses, gifts, prizes (lottery winnings), rental income, trust income, pensions, annuities, dividends and capital gains. Is the total amount of both parent’s Gross Monthly Income. Total Child Support Obligation is divided between the parents in proportion to their gross monthly income. For example: If the Combined Adjusted Income is $10,000 and the Father’s Adjusted Gross Income is $6500. Father’s share of the Combine Adjusted Gross Income is 65% and Mother’s share is 35%. Calculation of child support never includes a new marriage partner, only the parent who is involved in the divorce. Using the factors described in this section and the Child Support Worksheet, the court will be able to determine which parent (if any) should pay child support. The law provides that when the court grants a legal decision-making and parenting time order, it also must decide what amount of child support should be paid, by each parent, under the Arizona Child Support Guidelines. When change to an existing court order occurs, it is called a modification. In the context of child support, modifications are pursued in the Child Support Modification Court. This court is designed to simplify and eliminate delays in seeking child support modifications. Many child support orders are fair and equitable when entered; however become problematic when events change in people’s lives. 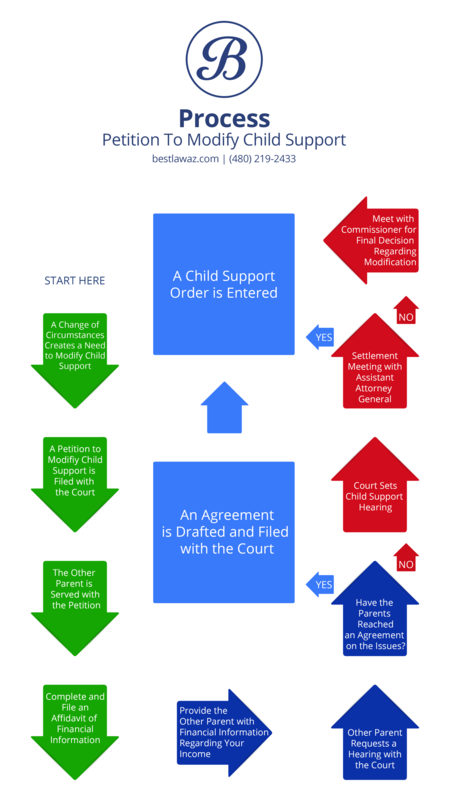 Procedurally, there are three different processes to file a petition to modify child support. Modification by Agreement: This is the easiest and quickest way modify a Child Support Order. You can file for a child support modification if both parties have come to an agreement to modify the child support. Child Support Modification by Standard Process: Under A.R.S. § 25-327 and 25-503, either parent or state agency may ask the court to modify a child support order if a substantial and continuing change in circumstances is shown. Under the Standard Process the parties receive an Order to Appear upon filing the petition. The Order grants the parties a one hour conference to attempt to resolve the issues between the parties. If an agreement is reached it will be reduced to writing. If the parties cannot reach an agreement in the conference, they are required to attend an evidentiary hearing where a Judicial Officer will grant a final order. Modification by Simplified Process: Either parent may request the court to modify the current child support order if there has been a substantial and continuing change of circumstances that has resulted in an order that varies 15% or more from the existing amount. In fact, a 15% variance is considered evidence of substantial and continuing change of circumstances. This process begins with the filing party serving the other party with the Petition to Modify to Request a Hearing. The receiving party may respond, do nothing or request a hearing. If the receiving party lives in Arizona they have twenty (20) days from the date they were served to act. If the receiving party lives outside of Arizona, they have thirty (30) days to respond. The court will notify the parties of how the assigned judge has decided to approach your case. The judge may ask for a hearing or may request a conference for the parties to attend. You may be able modify your Child Support Order. You can request a review every 3 years without any continuing and substantial change in circumstances. If it has been under 3 years, you must prove a substantial and continuing change of circumstances. Under Arizona law, the Court is the only legal entity that can modify child support. However, under certain conditions, parents can agree to a change child support with the Court’s approval. What determines a “substantial and continuing” change in circumstances? The court may consider many factors to determine if the change is “substantial and continuing. An increase or decrease in salary of either parent. An increase in expenses for court-ordered supervised visitation or supervised exchanges. Do gifts to my children count towards child support payments? No. Gifts will not offset any child support obligations. Yes, you can enforce the out-of-state child support order. It will be necessary for you to register the out-of-state child support order with the Arizona courts, so that Arizona has jurisdiction and you have an Arizona case number. To “register” your case means that you will need a certified copy of your domestic relations file from the other state and file it with the Arizona courts. Can I be reimbursed for travel expenses related to parenting-time visitation? In cases where the one-way travel distance exceeds 100-miles, a travel reimbursement may be ordered by the court. When considering a reimbursement the court will consider the parties’ financial situations and conduct, such as a change of residence and the reason for the move. Any reimbursement allocation will not change the amount of child support ordered. A modification of child support is the process of legally changing the child support amount paid by one parent. A child support modification is necessary when there has been a change in income of either parent or other financial changes in child care, health insurance, day care costs, etc. Is there a waiting period for when can a parent go to the court to ask for a modification? No, a parent may ask the court for a modification to child support at any time. However, it must be shown there is a change of circumstances before it will be modified or terminated. I already have a support order, but the payments are barely enough for my child. Is it possible to change the amount of monthly support I receive? Under federal and state law, you have the right to request a modification of your child support order. The Division of Child Support Enforcement (DCSE) can help you review for a modification of your child support order if you qualify. The review is based on the current income of the parents, the Arizona child support guidelines, and if there is a situation that is substantial and continuing, which would change your order by 15 percent or more. The review may result in an increase, decrease, or no change in your child support order. If you believe your case meets these criteria, you may click on the link to the modification packet and complete all of the required forms. Return them to the Division of Child Support Enforcement, P.O. Box 40458, Phoenix, AZ 85067; or you may go to a local DCSE office to pick up a modification packet; or you may contact DCSE at (602) 252-4045 or (800) 882-4151. If your review shows that a modification of your order is appropriate, they will send your case to the Attorney General’s office who will take it to court. I am receiving Temporary Assistance for Needy Families. Can I still have my child support order reviewed? Under Federal law, DCSE is required to review and, if appropriate, adjust a child support order every three years for families receiving Temporary Assistance for Needy Families. If a person wants to modify child support, how do they proceed? Under Arizona law, a parent may go to the court to modify child support. Specifically, a parent should go to the Superior Court of Arizona; the only court able to grant a child support modification. Can child support in arrearages be modified or forgiven? Usually the new child support will take effect on the 1st day of the following month after filing. For example; if a petition is filed on January 5th, the new child support, given that the modification is accepted, will start on February 1st. Yes, you still have an obligation to pay child support. You have an obligation to continue to pay child support until a court orders that you may stop. It is common for parents to want to withhold child support if the other spouse is not abiding by the court-ordered parenting time, but courts frown upon either party not following the court’s orders. If an obligated parent does not pay child support, you may file a Petition to Enforce Child Support, Child Support Arrears and Medical Expense Reimbursement. Often, all three of those issues go together. It makes sense to include those three issues in one petition, because if the obligated parent is not paying child support, you will want to ask the court to enforce the child support order in effect. You will also want the obligated parent to pay for the months he/she did not pay, along with any medical expenses he/she did not pay. Also be advised that it is appropriate in that petition to ask for the obligated parent to pay your attorney’s fees if you hire an attorney for this issue. I am a non-custodial parent, but my child lives with me now. Can I change the child support order? Yes. When there is a change in visitation or custody of the child, you can either go to court or ask for a change in the child support order, or you may ask DCSE to modify the court order. You may be able to reduce child support or begin receiving child support from the other parent. How do I enforce the current or modified Child Support order if my former spouse stops paying? You can request an assignment order under A.R.S. § 25-323 and § 12-2454. An Income Withholding for Support is available on the Superior Court website to be filled out and filed with the Court. This will require your former spouse’s employer or other payor to withhold the amount from his or her wages or money owed to you and to send that amount directly to the AZ clearinghouse. You may also want to file a Petition to Enforce Child Support, Child Support Arrears and Medical Expense Reimbursement. All three of these issues should go in the one Petition because you want the Court to enforce the current order in effect, have the Court enforce the amounts not paid by your former spouse, along with any medical expenses. Ask for attorney’s fees in the Petition if you choose to hire one for this Petition. Do I need to provide both parent’s income for a modification? What if I don’t know the other parent’s income? Yes, you need both parent’s income. If the parent filing the modification does not know the other parent’s income; they may indicate that the amount stated is an estimation. Thereafter, the parent filing for modification has the right to request a verification of the other parent’s income from their employer. What are some other resources available to me regarding Child Support modification? You can visit the Superior Court website for your particular county, contact the Clerk of the Court, contact the Arizona Department of Economic Security or visit their website at www.azdes.gov. Title 25 of the Arizona Revised Statutes available online. The Maricopa County website is http://www.superiorcourt.maricopa.gov/. If my child support order is from another state, where should I ask for a review? There are a number of factors that determine where a review is actually conducted. If you have a case managed by DCSE or another state’s child support agency, you may request a review for a modification of your child support order to the child support agency that you normally contact for assistance. If you do not have a case with DCSE, you will need to consult with the court or a private attorney. What if my grandchild is living with me. There is a child support order for the non-custodial parent to pay child support, but the payments are going to my child. How can I receive the child support?